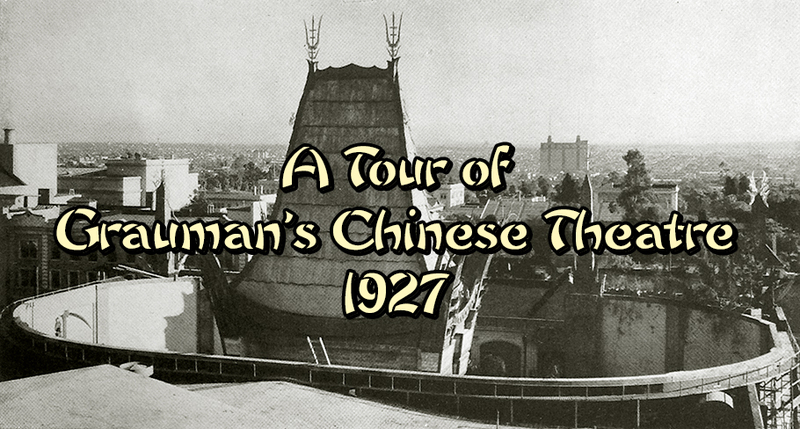 We should like to take you on a tour of Grauman’s Chinese as it appeared when it opened in 1927. The theatre we see today has undergone many changes over the years, beginning with the CinemaScope Era in 1953. But before that, the Chinese had a somewhat different look about it. And since there is hardly anyone alive today who can recall the theatre from these pre-1953 days, much less how it looked when it opened in 1927 — old photos are the only way to visit the Chinese during its earliest years. We hope that you enjoy your tour! Grauman’s Chinese sits under the warm California sun just prior to its opening in May, 1927. The theatre is 140 feet wide by 250 feet deep. 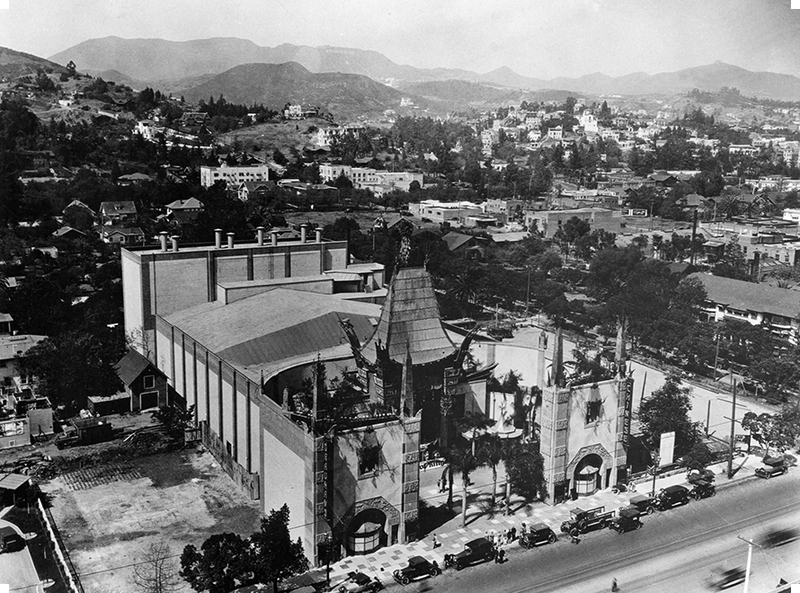 Since land was cheaper in Hollywood at the time, Grauman envisioned a spacious theatre with no balcony, the largest stage in Hollywood, and a large forecourt area, where patrons could mill about during the intermission between his lavish stage prologues and the feature film. Note the fact that there is no conventional marquee. 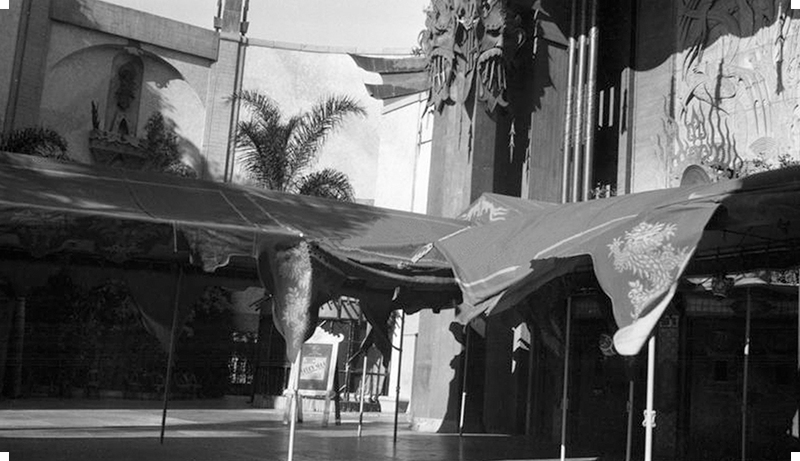 Subsequent operators would fix this problem, but Grauman did not want much signage at the theatre — at first. Grauman's Chinese Theatre, Hollywood, California. Aerial view from the southwest, early May, 1927. Photo by Burton Frasher, Sr., (1888-1955). The Chinese had been designed and built by the Mayer & Holler Inc., a construction comany whose chief designer was a man named Raymond M. Kennedy. What Kennedy came up with for the Chinese certainly has no architectural predecessors — not even people familiar with Chinese architecture know how to classify it — and it is this uniqueness which has made it the most photographed building in Los Angeles. This photo was taken the same day as the aerial photo. Grauman's Chinese Theatre, Hollywood, California. Aerial view from the southeast, early May, 1927. Photo by Burton Frasher, Sr., (1888-1955). This photo was taken from the roof of the one-story building across the street from the Chinese. 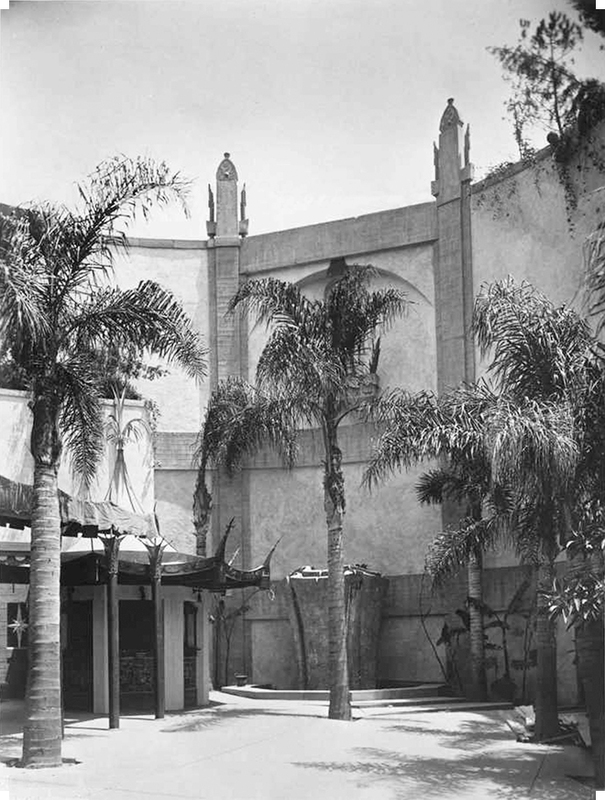 Long before the cement of the Forecourt would become world famous for its imprints of film greats, the entrance to Grauman’s Chinese was a lush semi-tropical oasis, sheltered from the roar of Hollywood Boulevard. Originally, four Queen Anne palms flanked the center isle, so that the grandeur and height (87 feet) of the central pagoda would be slowly revealed as you move toward the main entrance. Here in the Forecourt, patrons would mingle in the warm air, quaff the house brand of water and, if inclined, have a smoke. We will talk about colors in a moment, but from here, notice the dark coloring of the curved lintel and dentils above the center bronze gong. This gong would be struck at the conclusion of intermission, signalling to patrons that the second half of the program would commence shortly. Grauman's Chinese Theatre, Hollywood, California. Main pagoda and forecourt from the south, just slightly before opening day in May, 1927. Photographer unknown. Here we see some workmen putting the finishing touches to the main entrance just prior to opening day. The triple double doors are surmounted by a small pagoda topped with a statue, surrounded by a stylized flame punched out of metal, said to symbolize the imperishable spirit of creativity. Behind that is a large sandstone bas-relief of a dragon, which was purchased by Grauman in China for the theatre. The flanking columns are girded with metal theatrical masks with pendants, and which clutch the columns on all four sides. The three tiered capitals have scenes from antiquity painted on them in delicate rose colors, while the copper valence behind the gong has a dark / blueish-green color, typical of weathered copper. Grauman's Chinese Theatre, Hollywood, California. Main entrance doors and pagoda, 1927. Photographer unknown. From The American Architect, August 20, 1927, page 268; "Chinese Theatre at Hollywood, California." The Architectural and Building Press, Inc., New York City. Courtesy of Kurt Wahlner. These photos, from 1940 and 1941, show the original color scheme for the exterior of the Chinese Theatre. The central pagoda's columns are a hand-painted mottled coral red, with the central dragon surrounded by a deep blue with gold-leaf piping around it. The lintel mentioned earlier is actually a brownish color, while the dentils are black. The great copper roof is in its oxidized glory, while the walls of the Forecourt and the street facade are a yellowish green with bold swaths of a slightly different shade criss-crossing the flat expanses. The uprights of the street facades are left as raw concrete. Note also the red canvas canopy stretching out from the main entrance to the street. More about this in the next shot. ABOVE LEFT: Grauman's Chinese Theatre, Hollywood, California, during the engagement, from Tuesday, October 8, 1940, to Tuesday, October 15, 1940 of The Westerner and Yesterday's Heroes. Photographer unknown. ABOVE: Grauman's Chinese Theatre, Hollywood, California, during the engagement, from Friday, September 5, 1941, to Thursday, September 11, 1941 of Dr. Jekyll and Mr. Hyde and Down in San Diego. Photgrapher unknown. Photos Courtesy of Kurt Wahlner. Originally, the Chinese Forecourt was outfitted with a canvas canopy running from the main entrance to both the street (to the left), and to the parking lot (to the right). Red in coloring with polished brass uprights, it was highly decorated with stencilled dragons and piping and contained electric lanterns along the peak inside. The stencilled canopy was part of the theatre’s original equipment, designed to be set up during inclement weather, and taken down again afterwards, which is why some photos from this very early period have the canopy and some do not. Grauman's Chinese Theatre, Hollywood, California. Forecourt during the engagement, from Thursday, November 1, 1928 to Wednesday, January 16, 1929 of Noah's Ark. Photographer unknown. 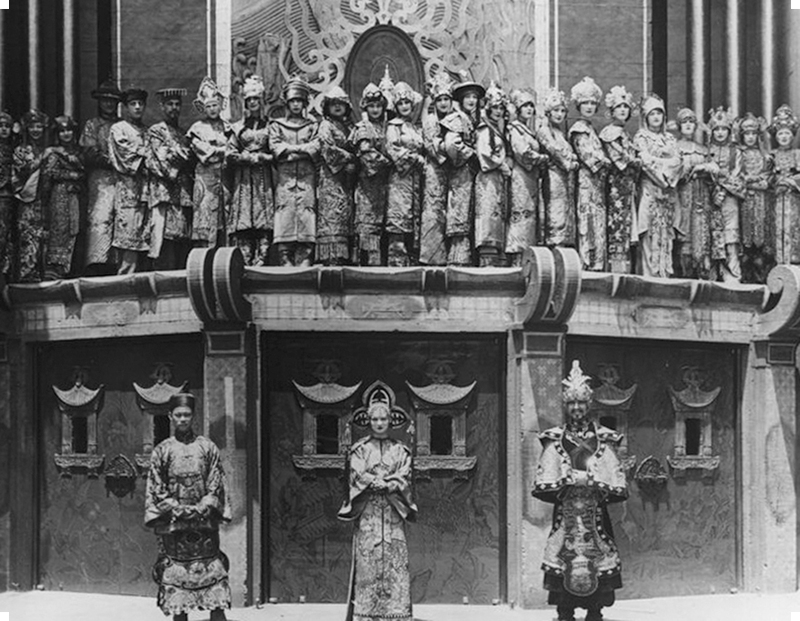 In the beginning, the Chinese held two performances each day: a matinee, and an evening performance. All seats were reserved. The tiny little octagonal building on the left of this shot is the original "Pagoda" box-office, and is where all of the ticket sales and mail order fulfillment was handled. In addition to the six ticket windows, there was a workroom and a walk-in safe. In the center of the shot is one of the two forecourt fountains. Please note the absence of a railing around the fountain — simpler times! Before the forecourt began to fill in with footprints, the space was studded with serveral palm trees, while the fountain has steps leading down the slope. Again, the walls were all of the same yellowish green with the bold criss-crossing, while the pillasters were of a much darker shade with some brown tossed in. Grauman's Chinese Theatre, Hollywood, California. Forecourt looking east, with the "Pagoda" box-office, 1927. Photographer unknown. A very early family snapshot taken in the Forecourt, probably in the Summer of 1929, these folks were identified as the Rennie Family — visiting from where? Unknown. This photo gives us an excellent sense of the Forecourt during the early period, with customers looking around, the poster cases and signage and most of all — the clothes. Grauman's Chinese Theatre, Hollywood, California. 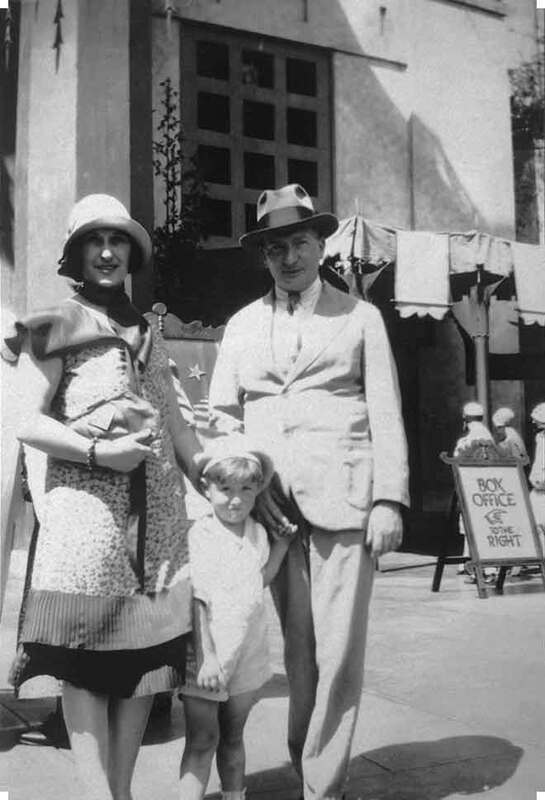 Forecourt snapshot with "The Rennie Family" probably taken during the Summer of 1929, during the engagement, from Thursday, June 20, 1929 to Sunday, September 22, 1929, of The Hollywood Revue of 1929. Photographer unknown. Photo courtesy of Kurt Wahlner. We enter the Chinese theatre through these beautifully detailed sets of double doors. The door frames are all rough concrete with designs painetd on them, while the doors themselves have elaborate scenic paintings around the carved windows. The original color of these designs remains a mystery, since no one took color photos showing this area. The theatre's ushering staff is shown in this publicty photo, with the floor managers below, and their supporting ushers above. The costumes they wore were unbelieveably elaborate, colorful and fanciful, with tons of appliqué work holding tiny mirrors to catch light. Grauman's Chinese Theatre, Hollywood, California. Forecourt with theatre ushering staff. May,1927. Phographer unknown. This publicity photograph was taken of actress Raquel Torres (1908-1987) in 1928 as part of the publicty for her first film appearance as the female lead in W. S. Van Dyke's White Shadows in the South Seas (which played at the Chinese in August through September, 1928. This photo gives a sense of how elaborate the staff costumes were for the Chinese Theatre. And this outfit is for a mere usherette. Raquel was working at the theatre as an usherette when "a director" spotted her, signed her to a contract with Metro-Goldwyn-Mayer, and before long, she found herself working in Tahiti making White Shadows. 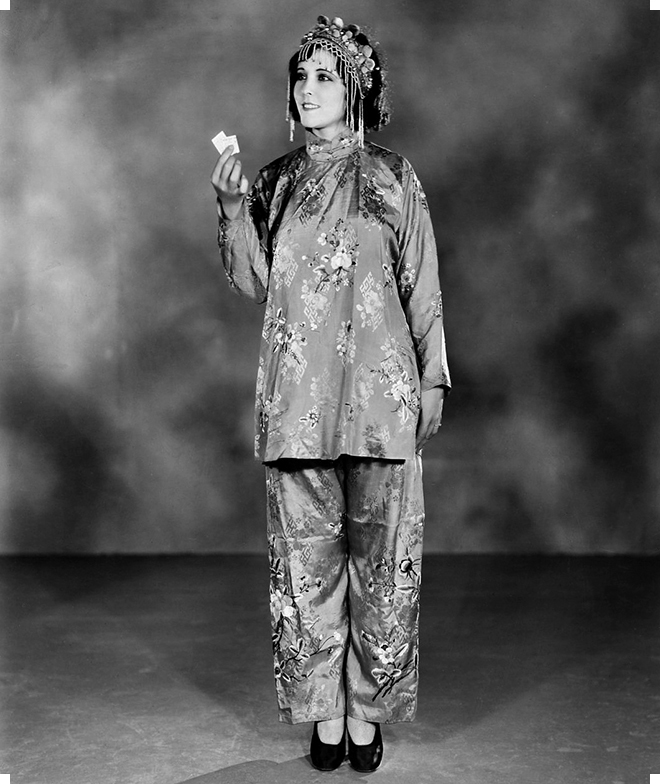 Raquel Torres (1908-1987) in her Grauman's Chinese Theatre costume, circa 1928. Photo by Clarence Sinclair Bull (1896-1979). Courtesy of Kurt Wahlner. Just past the main entrance doors is a small vestibule — three sets of double doors in a straight line. At either end, in gold leafed alcoves, were tables which is where programs for the performance were stacked. The doors were a black lacquer finish with red and gold decorative designs. Grauman's Chinese Theatre, Hollywood, California. Vestibule looking northeast. Photo taken during the engagement, from Friday, November 4, 1927 to Sunday, January 22, 1928, of The Gaucho. From Motion Picture News, February 4. 1928, page 333; "Brains and Arms of Showmanship in Phone Link" by Carl. J. Begemann. Motion Picture News, Inc., New York City. For a deluxe presentation house, the Chinese Foyer was tiny. Only 32 wide x 19 deep x 32 feet tall, the foyer is more of a formality — an ante-room if you will. Patrons would arrive for the showing close to the appointed matinee or evening performance time. During intermission, they could hang out in the forecourt, unlike the massive lobbies of theatres back east, where crowds waiting in continuous performance houses would require someplace to wait for the next show — especially in bad weather. The walls are angled slightly, to resemble coromandel screens, which are painted with traditional Chinese garden lanscapes in tones of ebony and ivory. In the center of the room hangs a large bronze lantern, nearly 6 feet tall, suspended from a striking silver and gold leafed ceiling. In the corners stand columns of lacquered red. The doorway leading to the side foyer in the distance is gold leafed with a silver leaf background, flanked with rich draperies. The doorway on the left leads to the auditorium, and is similarly draped and valenced. The carpets were all hand-woven in Hong Kong, but the colors are lost. Note the traditional Chinese chairs and benches here and there, as well as one of the wax figures in Chinese garb in the corner. Grauman's Chinese Theatre, Hollywood, California. Main Foyer looking east, 1927. Photo by J. Howard Mott (1888-1937). From the California State Library, Sacremento, California, Mott-Merge Collection, Record Number: 001416436. The Main Foyer was flanked on both sides by twin side foyers. This photo shows the one on the east side. The door on the left leads out to the Forecourt, and is painted a black lacquer color, with brass push bars shaped to resemble bamboo. Surrounding the door is ecru colored travertine marble, while the walls are gold leafed. Wax figures and chairs abound, along with hanging tapestries, and the red lacquered coffered ceiling. Grauman's Chinese Theatre, Hollywood, California. East Side Foyer looking southwest, 1927. Photo by J. Howard Mott (1888-1937). From the California State Library, Sacremento, California, Mott-Merge Collection, Record Number: 001416436. 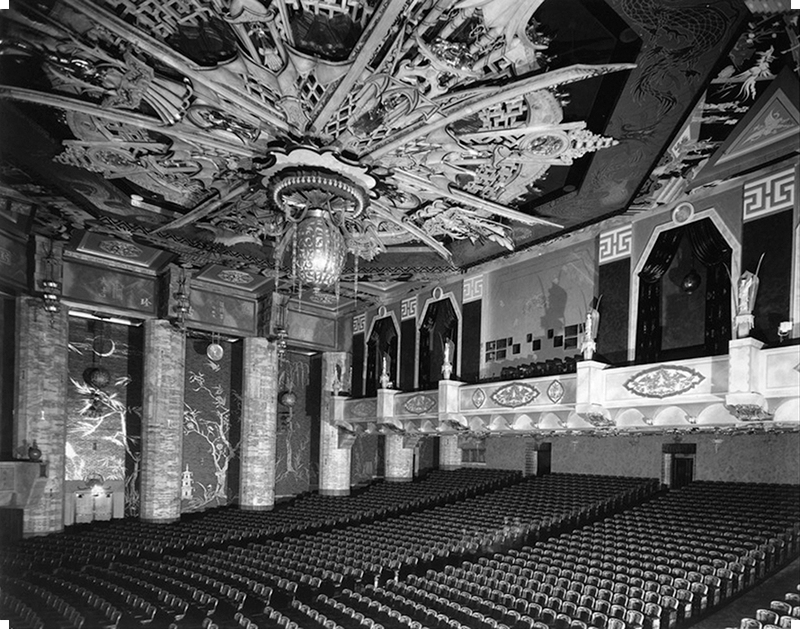 The auditorium of Grauman's Chinese has to rank as one of the most unique interiors ever created. Richly decorated yet still simple in its forms, the huge theatre has a heft and mysterious power which makes it compliment a film perfectly. A film might not be the best quality, but the Chinese gives each film a great presentation. Some things to point out here are the seats, which run from the foyer down to the orchestra pit, in which you may see the Chinese paper lantern music stands. 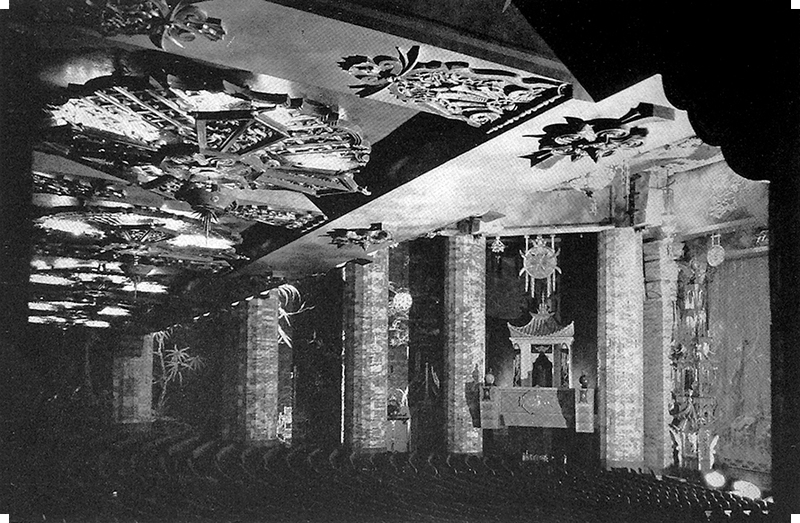 The projection room and all the figures running along the front of the overhang, the huge lantern in the center of the ceiling, with its six pendants of lights. The decoration on the ceiling is the organ grille; the pipes are located in a chamber above the stage. Sound travels through a tone chute and thus floats down over the audience. Grauman's Chinese Theatre, Hollywood, California. Auditorium from the stage, 1927. Photographer unknown. From The American Architect, August 20, 1927, page 252; "Chinese Theatre at Hollywood, California" The Architectural and Building Press, Inc., New York City. Courtesy of Kurt Wahlner. 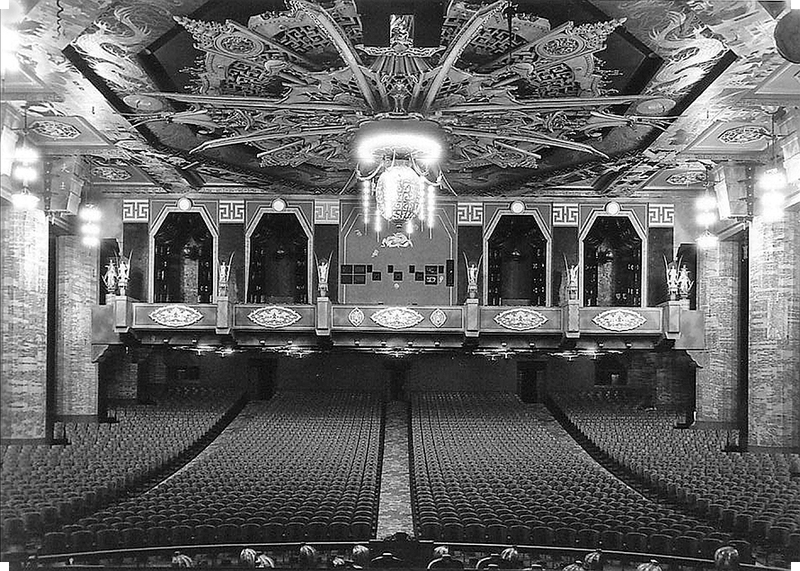 Theatre historians have long insisted that Grauman's Chinese originally had a seating capacity of over 2,000. Cinema Treasures has it at 2,200 seats. In his 1968 monograph on the Chinese, historian Terry Helgesen (1914-1995) estimated the capacity at "nearly 2,400," while our friend Bill Counter's supurb losangelestheatres.blog has it more realistically at 2,054. 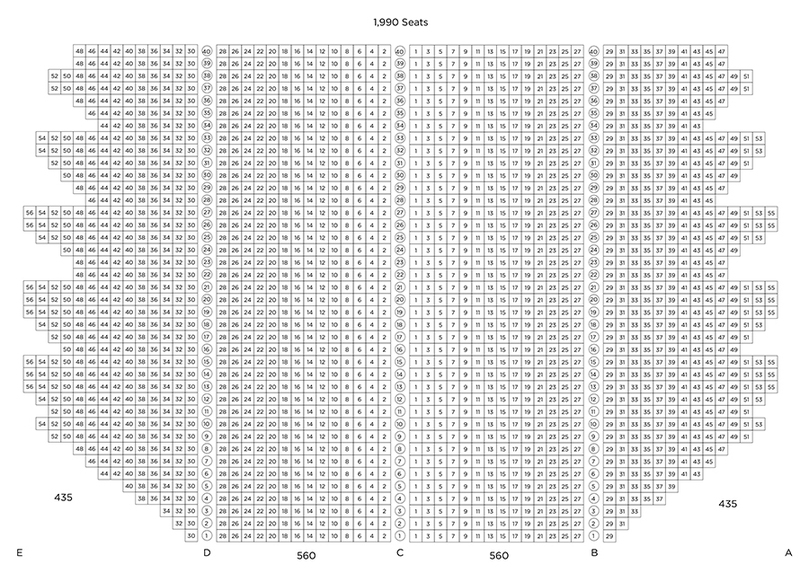 Our analysis of all the historical photos indicates that the actual seating capacity was 1,990, not counting the upstairs boxes. This seating chart has been created by scrutinizing all of the availible photos, and is corroborated by surviving ticket stubs. 2,000 is a nice round number, and is a line of demarcation regarding theatre sizes, with 2,000 being sort of a "cutoff"; anything larger would require different equipment, Union rules and whatnot. An interesting detail here is the fact that the seats in the sides of the theatre are wrapped neatly around the sidewall columns, since a patron was only looking at the narrower stage. This spectacular photo gives one a good impression of how far down the central lantern hung down — it was a major presence in the auditorium. Much of the auditorium has its original colors, from the ecru color of the travertine marble columns to the darker red coloring of the timbers running across them, to the dark brown and silver designs on the brick walls behind the columns, to the red of the seats. Terry Helgesen notes that the theatre always had a hint of perfume in the air — frankincense mostly — and never a white light shone in the theatre ever. Grauman's Chinese Theatre, Hollywood, California. Auditorium from the northwest, 1927. Photo by J. Howard Mott (1888-1937). From the California State Library, Sacremento, California, Mott-Merge Collection, Record Number 001416434. Since all of the seats in the theatre were on the one floor, what normally would have been the balcony was occupied by what soon came to be called "The Cathay Lounge." 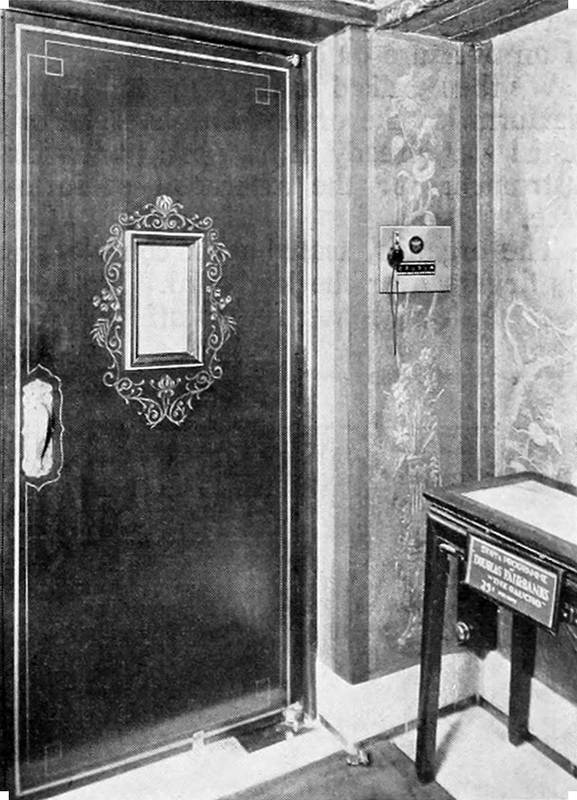 It was here that the projection room was located in the center, flanked on both sides by private boxes for Mr. Grauman and his guests, along with a conference room, storage, employee lockers, Mr. Grauman's office and so on. The overhang is very high up — almost 20 feet, while it is 42 feet to the ceiling, with the auditorium being almost 100 feet wide. It is these dimensions and proportions which gives the back of the house such a huge feeling, dwarfing the spectator. Grauman's Chinese Theatre, Hollywood, California. Auditorium from the stage, 1927. Photographer unknown. From The American Architect, August 20, 1927, page 260; "Chinese Theatre at Hollywood, California." The Architectural and Building Press, Inc., New York City. Courtesy of Kurt Wahlner. Here, under the Cathay Lounge, the view toward the stage is reduced by the richly decorated underside of the lounge. Ten elaborate ceiling cartouche in a multi-layered design are boxed in with flat areas, meant to resemble timbering. The plasterwork of the fixtures is gold-leafed, with small lanters hanging down from their centers. We also get a glimpse of the slope of the auditorium floor, rolling down in 40 rows to the orchestra pit, flanked on either side by pogoda-style "singing boxes," each with heavy concrete balconies on front, surmounted by glowing globe finials (they are turned off in this shot). Grauman's Chinese Theatre, Hollywood, California. Auditorium, looking toward the stage and east sidewall under the Cathay Lounge. Probably taken during the engagement, from Monday,May 7, 1928 to Sunday, June 24, 1928, of The Trail of '98. Photo by J. Howard Mott (1888-1937). From the California State Library, Sacremento, California, Mott-Merge Collection, Record Number 001416434. Here is a rare view of the "singing box" on the east side of the auditorium. Like much of the Chinese, the box has a very heavy feel to it, with the lower portion jutting out from between the side columns to a considerable distance. Above is a gold-leafed medallion hanging from the overhead lintel. The box pagoda is laid against a plaster wall treated with a dark red mottled texturing. There is a drape hanging down from the box, but it is unknown as to the purpose of this drape. This photo was taken slightly before the opening of the theatre, since the little drape covering the exit to the box had not been hung yet. Grauman's Chinese Theatre, Hollywood, California. Auditorium showing east singing box, 1927. Photographer unknown. From "Portfolio of current architecture" in The Architectural Record, Number 62, July 1927, pages 113-122. Courtesy of misterdangerous.wordpress.com. The real glory of the Chinese Theatre was its stage — 140 feet by 40 feet deep, with a procenium opening of 65 feet wide by 30 feet tall. 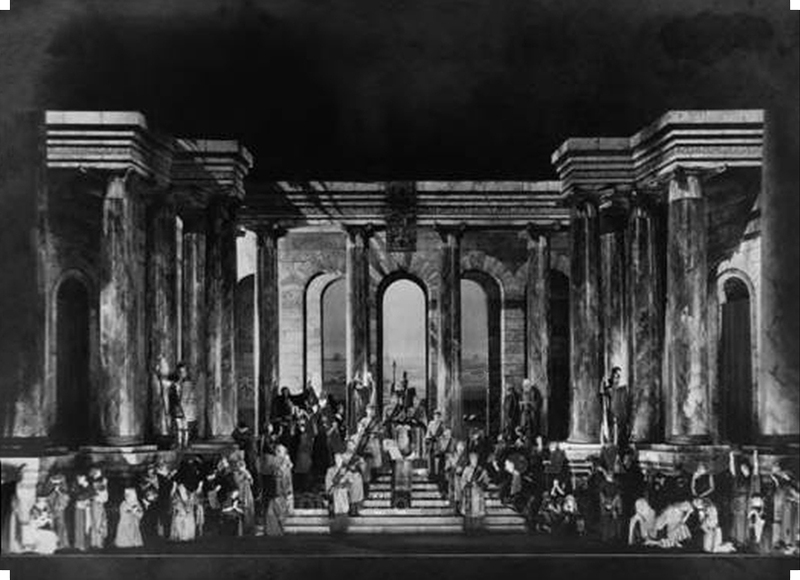 The Grauman Prologues were to be very lavish affairs, calling for the utmost in stagecraft. Since the beginnings of the Theatre, fire has been a major concern — especially before the invention of electric lights. But even still, backstage fires were possible. One way to sheild audiences from fire was to screen them off by means of fire doors and most importantly, the asbestos curtain, which slid down in a narrow track just inside the stage opening. The asbestos could be brought down simply by pulling a release pin backstage. Local laws required that the asbestos curtain be raised and lowered once each day to ensure functionality. 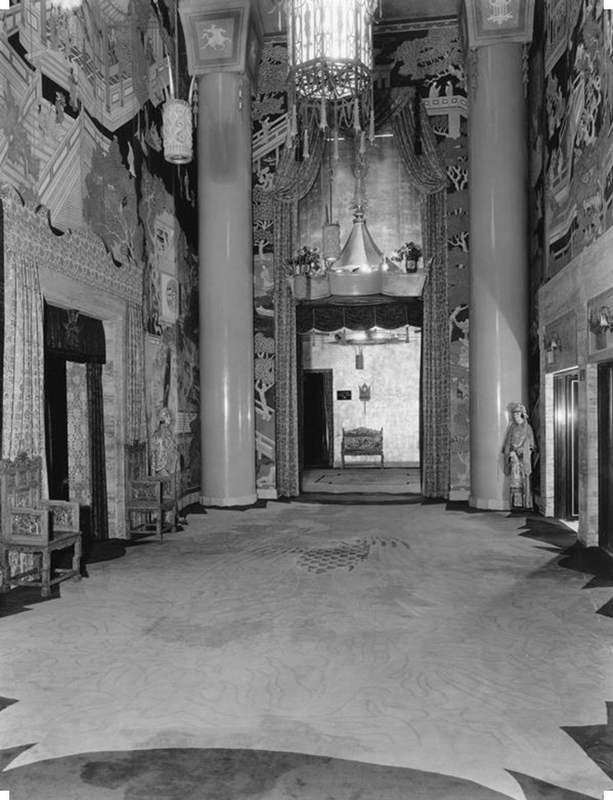 At the Chinese, the asbestos — which was in view before the matinee's performance, and came back down again at the conclusion of the evening performance — was painted to resemble a huge laqcered cabinet, with the peacock blue background color contrasting with all the rest of the Chinese red auditorium. For some reason — no one knows why — photographs of the entire stage opening were never taken at the Chinese. Something about the shape of the auditorium prevented it, perhaps. 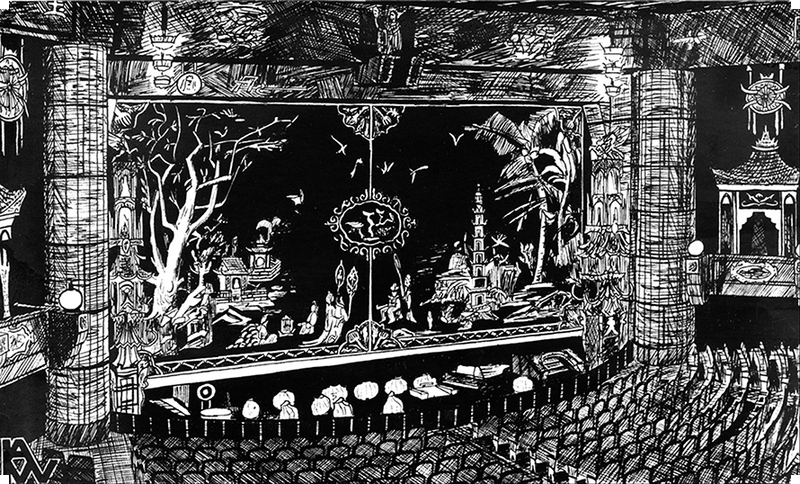 Artist Kurt Wahlner did this drawing, showing the asbestos curtain, orchestra with the Chinese paper lantern music stands and the free-standing tower pagodas, which rose out of the pit and flanked the stage. Grauman's Chinese Theatre, Hollywood, California. Auditorium from the southwest, with asbestos curtain, 1927. Drawing by Kurt Wahlner, circa 1976?. Felt-tipped pen on paper, probably 12" x 7." Courtesy of the Theatre Historical Society of America, Pittsburgh, Pennsylvania, Terry Helgesen Collection. After the asbestos, we come to this fanciful house curtain, which eyewitness Terry Helgesen tells us is of pale gold silk velvet, with the trees painted on with silver radium paint. The tree design could thus reflect any color of light projected onto them. This photo was taken a bit later than our tour, as the Chinese paper lantern music stands have been replaced with conventional ones, with Oscar Baum leading the orchestra. Grauman's Chinese Theatre, Hollywood, California. 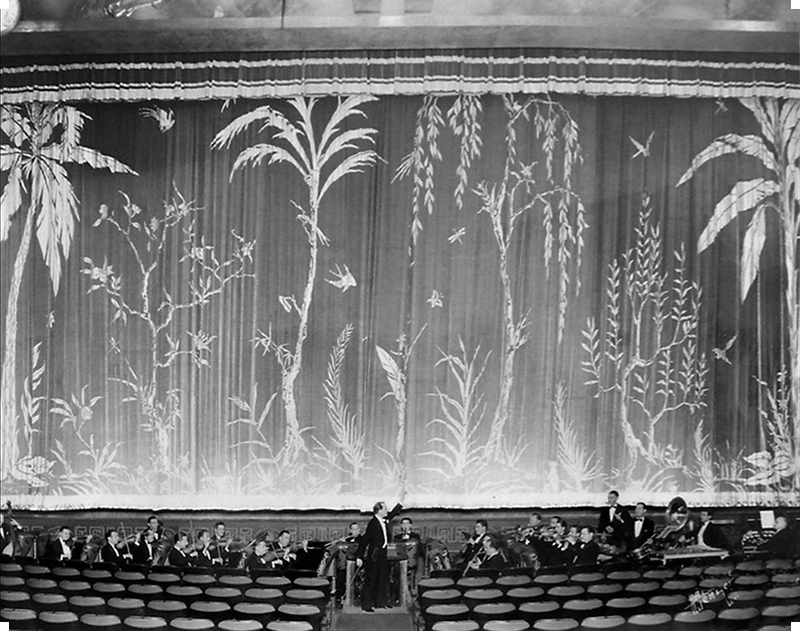 Auditorium with Oscar Baum conducting the Chinese Symphony Orchestra, and house curtain, circa 1932. Photographer unknown. Looking northwest across the vast auditorium, we see some of the lavish detailing of the underside of the Cathay Lounge, as well as a hint of the slope of the orchestra floor steating. Additionally, there is the "singing box" on the west side, and the freestanding bronze and crystal bedecked pagoda just at the edge of the stage opening. A couple of the Chinese paper lantern music stands are illuminated in the orchestra pit. Grauman's Chinese Theatre, Hollywood, California. 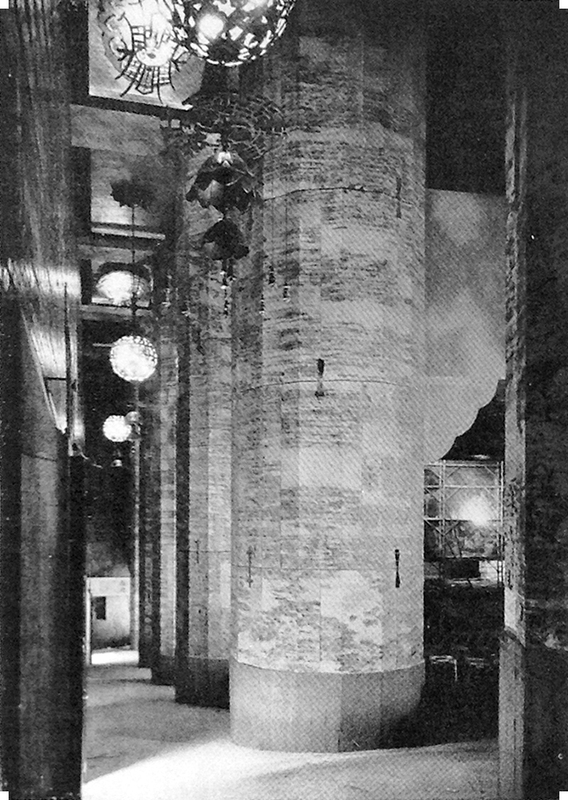 Auditorium west wall from under the Cathay Lounge, 1927. Photographer unknown. 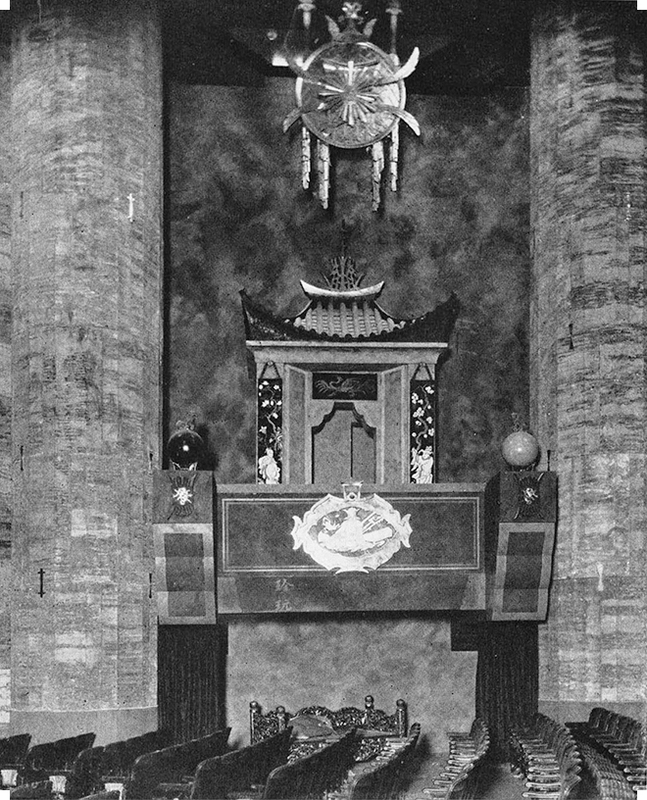 From The American Architect, August 20, 1927, page 256; "Chinese Theatre at Hollywood, California. "The Architectural and Building Press, Inc., New York City. Courtesy of Kurt Wahlner. Here in the rear of the orchestra floor, we may see how steeply raked the seats are at the back. Nearly a third of the audience is tucked under the Cathay Lounge, which partially accounts for its lavish celing decoration. The door at the left leads to the main foyer, while the door in the center leads to the west side foyer. The tiny windowed section to the left of the last column is not really a "crying room" so much as it is a "crying space," as they weren't enclosed off from the side foyers. Grauman's Chinese Theatre, Hollywood, California. Auditorium back wall from the northeast, 1927. Photo by J. Howard Mott (1888-1937). From the California State Library, Sacremento, California, Mott-Merge Collection, Record Number 001416324. This is one of the four doors leading from the auditorium to the exit passageways running alongside the building out to the street. The doors are black lacquer cabinets in appearance, with brass hardware and fixtures on them. The door is surrounded by a bezel of concrete adorned with an ironwork mandala; the "exit" sign rides before it, and is sandblasted glass with red lettering. The brick wall behind is, as you may see, various shades of a rusty redish color with a semi-glossy finish, with fanciful mural designs painted in silver paint, reportedly designed by Xaivier Cugat. Here also may be seen an example of the "cloud lift" carpet running throughout the auditorium. Grauman's Chinese Theatre, Hollywood, California. 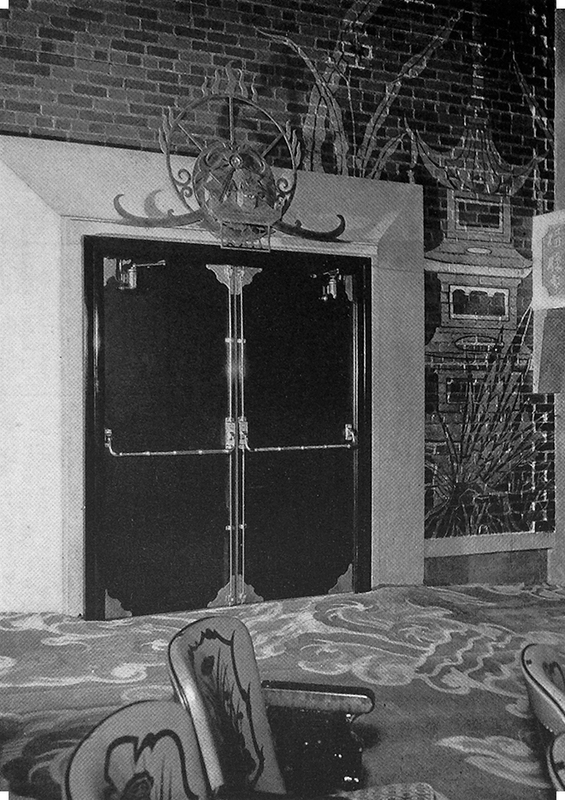 Auditorium northwest exit doors, 1927. Photographer unknown. 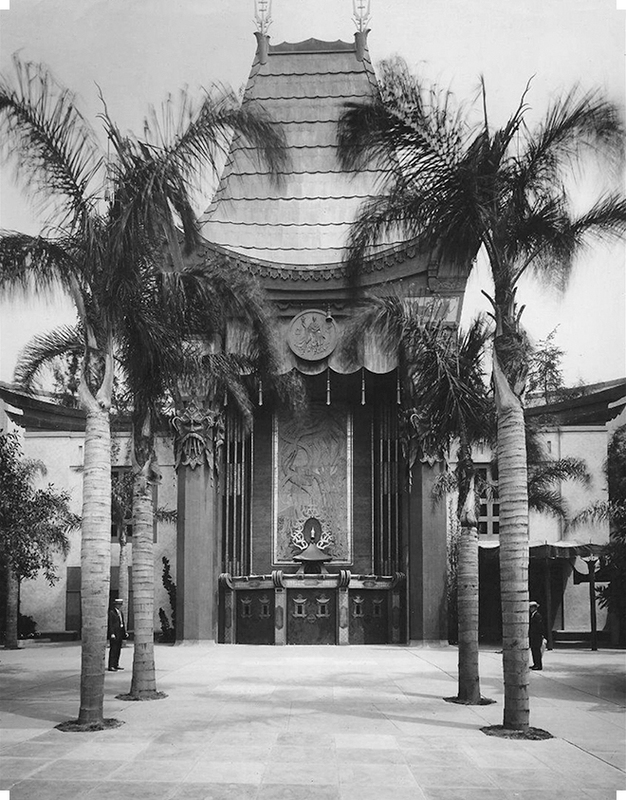 From The American Architect, August 20, 1927,page 261; "Chinese Theatre at Hollywood, California." The Architectural and Building Press, Inc., New York City. Courtesy of Kurt Wahlner. One of the great walks around the Chinese is that of Aisle A on the west side, or Aisle E on the east side of the auditorium. Here can be seen the semi-gloss of the brick walls, the silver and dark red coffers of the ceiling, the massive marble colums (some of which hide the air circulation returns), as well as the considerable collection of lanterns, purchased by Mr. Grauman in the far east. This photo was taken before the aisle carpets were laid down, or the seats bolted to the floor — well — it looks like some of them have been installed. It also appears that there is perhaps some scenic work going on on the stage in the background on the right. The Cathay Lounge rests on the backwall of the auditorium, as well as the trusses running 100 feet across the rear of the orchestra floor, but it does not touch the auditorium walls back here. So this thrust upwards continues past the overhang line and runs two bays further back to the backwall. This tall, dimly lit area is our favorite — full of mystery. Grauman's Chinese Theatre, Hollywood, California. 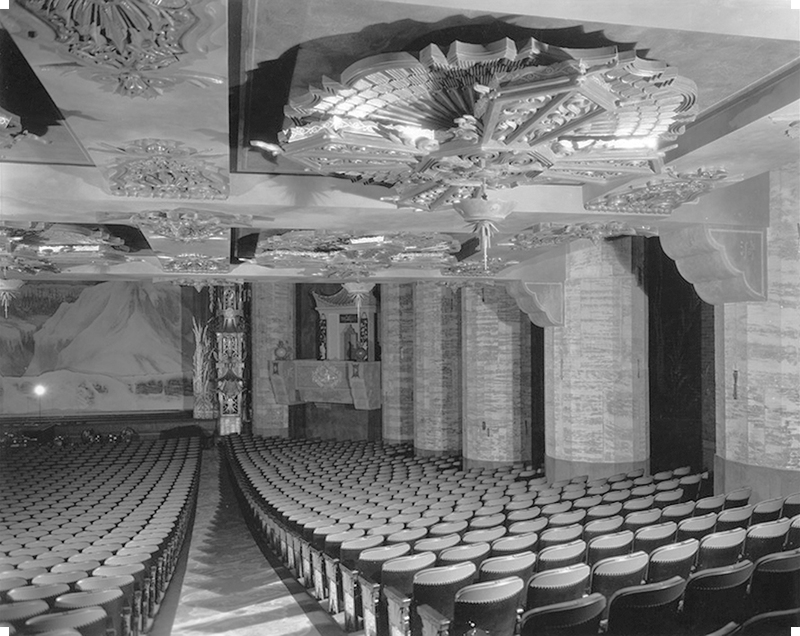 Auditorium looking down aisle A toward the stage, 1927. Photographer unknown. 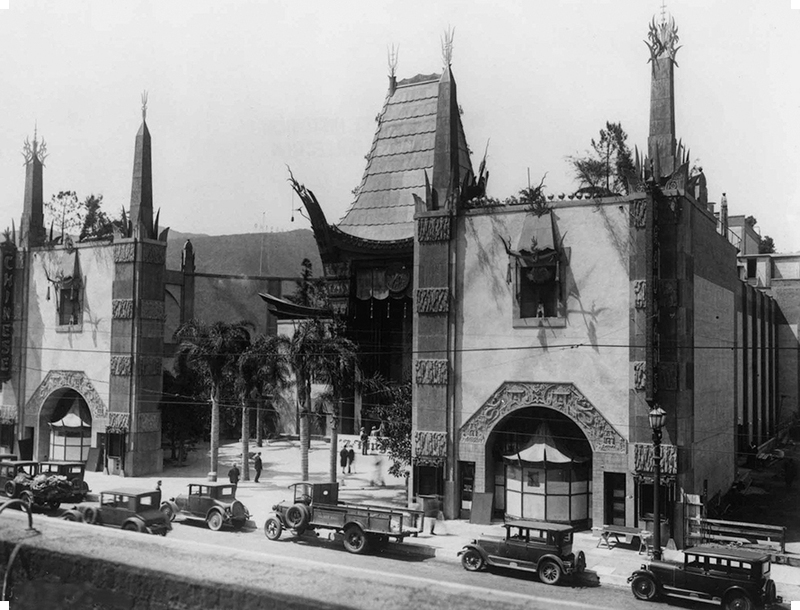 From The American Architect, August 20, 1927, page 252; "Chinese Theatre at Hollywood, California." The Architectural and Building Press, Inc., New York City. Courtesy of Kurt Wahlner. Seats in the auditorium were given special attention. The cast-iron seat standards at the ends of each row were encrusted with a golden finish on the lower part, and a red enamel in the upper. The arm rests were given a abstract carved design, painted black with touches of gold rubbed in. The seat backs were red leatherette with three different designs imprinted onto then. 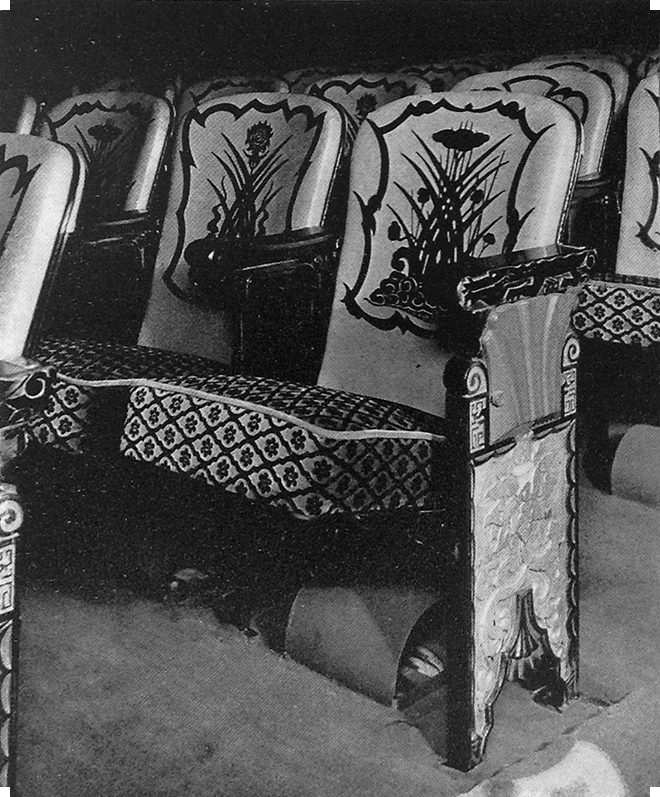 We don't know how they were imprinted, but it seems as though it must have been a fairly burly method to withstand the wear and tear a theatre seat would be subjected to. The seat bottom was a more conventional sculpted velour, in red and black. The seats at the Chinese were attached to stepped risers — each row was perfectly level, except here in the first several rows, where there are no steps. The curved sheet of metal under this particular seat is a vent leading down to what is called a plemum chamber — a large room under the orchestra floor into which one forces fresh or cooled air, and which escapes out of these vents, thereby cooling the theatre right where it is needed most. Grauman's Chinese Theatre, Hollywood, California. 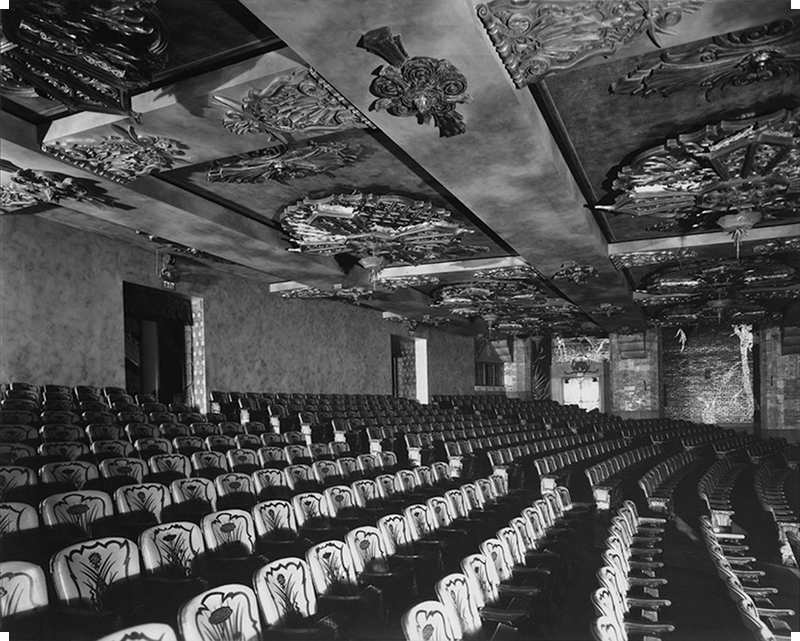 Auditorium seating down front, 1927. Photgrapher unknown. 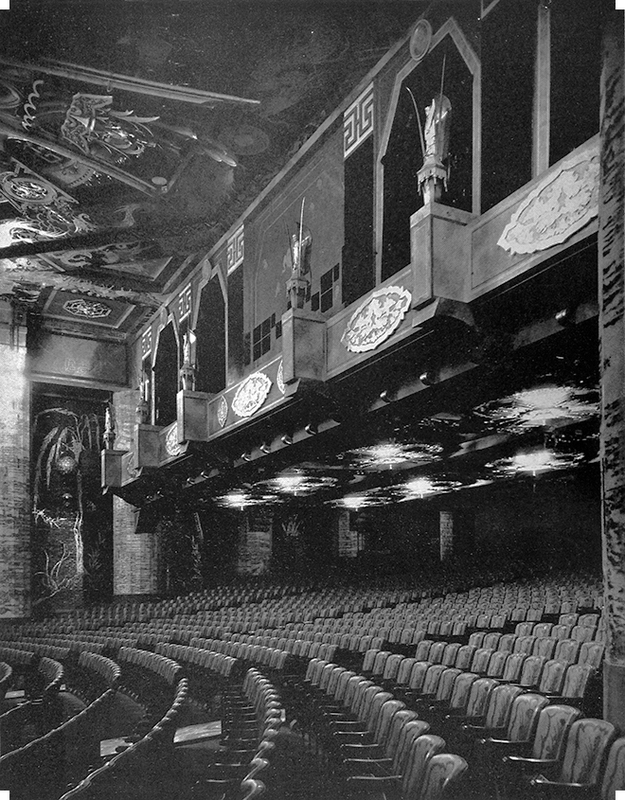 From The American Architect, August 20, 1927, page 264; "Chinese Theatre at Hollywood, California. "The Architectural and Building Press, Inc., New York City. Courtesy of Kurt Wahlner. This unfortunately cropped picture from the Terry Helgesen Collection shows the stage pagoda on house left rising out of the orchestra pit. These tremendously ornate freestanding pagodas on either side of the stage were made out of bronze and were bedecked with crystal pendants, all of which caught the light in the theatre. Grauman's master stroke was the Chinese paper lantern music stands. Each one had to be large enough to accommodate open sheet music and a lamp for the musicians to read it by, but also red, blue and green light bulbs inside which illuminated the lantern facing the audience. The lights were on rheostats (dimmers), and so the music stands could become any color desired, or any intensity — full up, or very dim, or anything inbetween. They could be linked with rheostats controlling the house lights or the stage lights, creating the same color as in the house or on the stage, or they could be controlled separately. Just a lovely idea. Grauman's Chinese Theatre, Hollywood, California. Auditorium orchestra pit, 1927. Photographer unknown. From Grauman's Chinese Theatre: A Console Feature, no date, circa 1968, page 10, by Terry Helgesen. Console Publications, Pasadena, California. Courtesy of Kurt Wahlner. The Chinese paper lanterns are seen here in this photo, taken during the run of The Gaucho, of conductor Arthur Kay (1881-1969) at the conductor's desk. The Chinese Theatre Symphony Orchestra would occasionally boast 65 members in the pit; the conductor's desk was the command center, linked via an intercom with Mr. Grauman's office, the projection room, the switchboard, and others. Dials right before the conductor indicate the time, and the current speed of the film running through the projector. The speed could be adjusted to fit the tempo of the music. The front of the desk is unusual in that it is covered with velour, allowing the conductor to really lean in there while encouraging the players to their greatest heights. Grauman's Chinese Theatre, Hollywood, California. 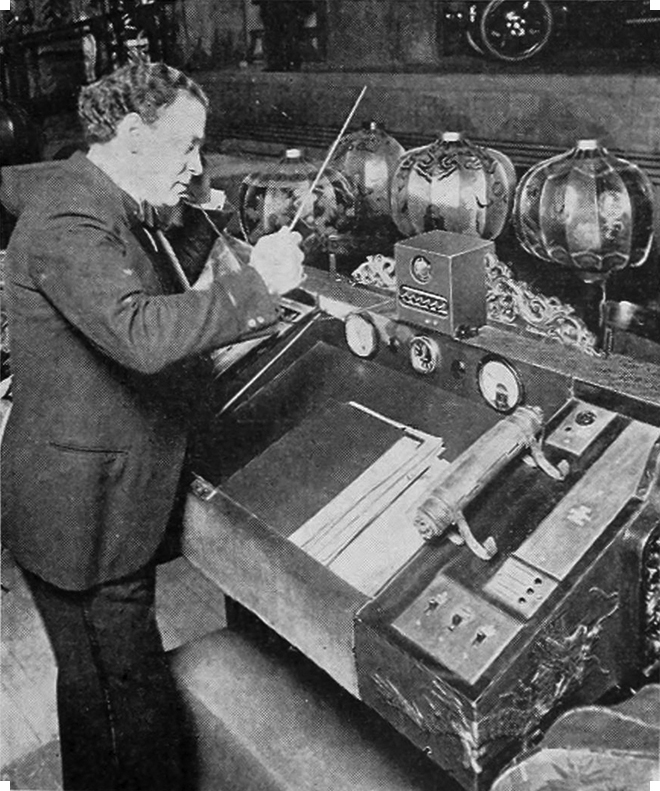 Arthur Kay (1881-1969) at the conductor's desk of the orchestra pit. Photo taken later in the engagement of The Gaucho, after Friday, December 16th, 1927. Photographer unknown. From Motion Picture News, February 4. 1928, page 333: "Brains and Arms of Showmanship in Phone Link" by Carl. J. Begemann. Motion Picture News, Inc., New York City. Also in the orchestra pit, on house right, was the Wurlizer pipe organ console. 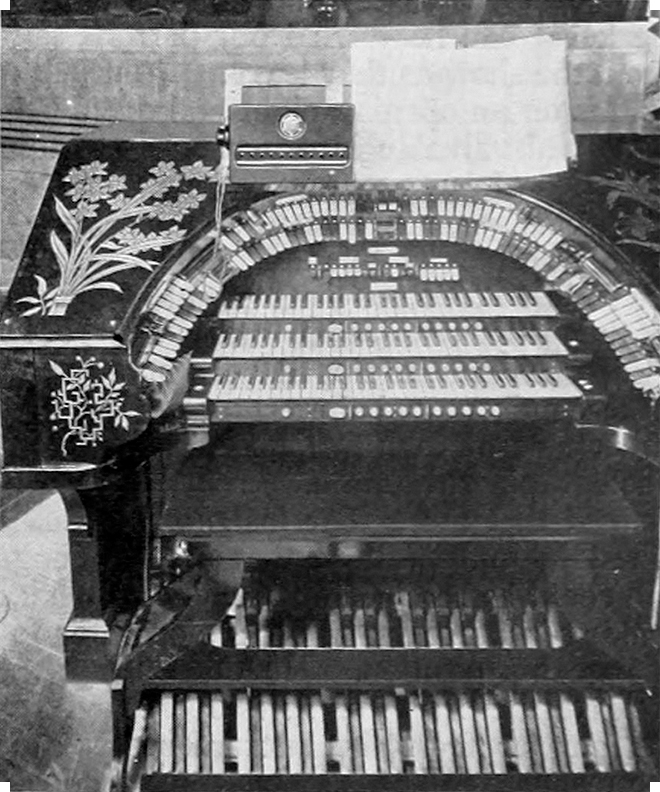 Stained a cherry color and decorated with golden flowers, this Wurlitzer is what is known as a "Style 260 Special" and has three manuals (keyboards) and 17 ranks of pipes. 17 ranks doesn't sound like much, but this baby could really wail if needed. The pipes were all contained in a chamber running across the top of the stage opening, with the entire celing of the theatre as the grill which the sound came through. Wurlitzers carry opus numbers, and this one is number 1541. It was shipped from the factory in North Tonawanda, New York, in December, 1926, and cost $26,879.04. Grauman's Chinese Theatre, Hollywood, California. Wurlitzer organ console. Photo taken later in the engagement of The Gaucho, after Friday, December 16th, 1927. Photographer unknown. From Motion Picture News, February 4. 1928, page 334: "Brains and Arms of Showmanship in Phone Link" by Carl. J. Begemann. Motion Picture News, Inc., New York City. Photos of the Grauman Prologues are as scare as hen's teeth, but this picture from the section One — Twilight Prayers of the Common People — from the "Glories of the Scripture" Prologue accompanying King of Kings for 24 weeks at the Chinese gives a good rendering of how lavish these Prologues were. This was the first stage picture of the Prologue, after the overture. Can you imagine how audiences felt upon seeing this massive set with all of the actors in their georgeous costumes? It only went on from there. Extras were hired at the stage door one half hour before showtime, and paid one dollar per performance. Grauman's Chinese Theatre, Hollywood, California. Stage with the Grauman Prologue "Glories of the Scriptures" during the engagement, from Wednesday, May 18, 1927,to Sunday, October 301, 1927 of King of Kings. Photographer Unknown. From Hollywood's Master Showman: The Legendary Sid Grauman, by Charles Beardsley, Cornwall Books, New York, 1983, page 20. 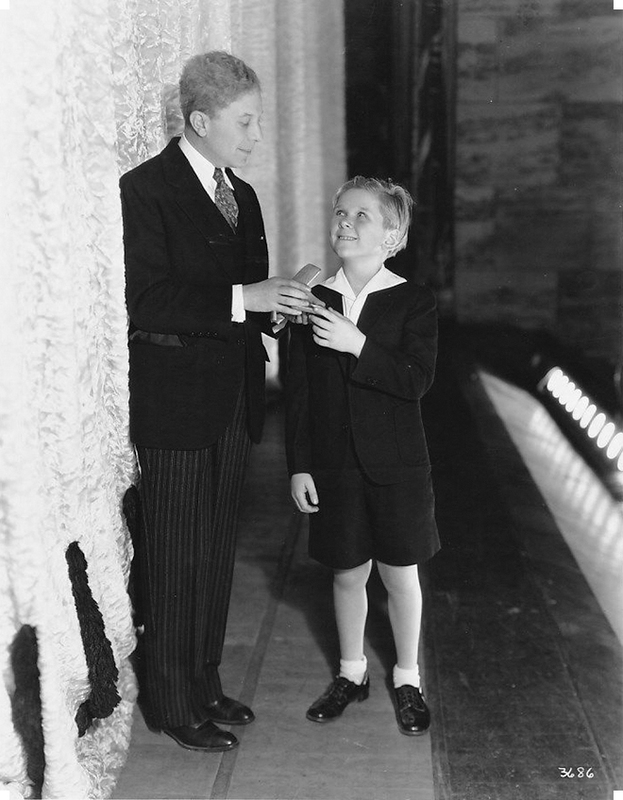 Pictures of the stage at the Chinese are few and far between, but here is a shot of Sid Grauman onstage, presenting a gift of a wristwatch to Jackie Cooper during the evening premiere performance of the Wallace Beery / Clark Gable film Hell Divers on Friday, December 25, 1931. The watch was to thank Cooper for participating in both matinee and evening premiere performances — they had two of 'em, and as a Christmas present. 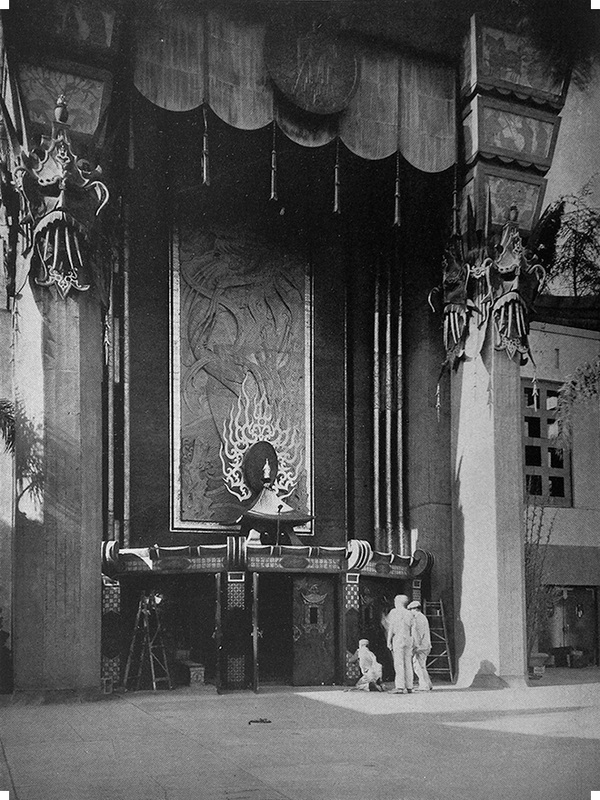 Grauman is standing before the "Ermine" curtain, which seems to have been installed for the Prologue accompaning Hell's Angels in May, 1930. In the distance over Cooper's head, we see the gap between the blocks of stone on the right forming the proscenium, and the curtain. This is the only photo (so far) showing the footlights at the Chinese; as it may be observed, they are of the "dip" configuration — one row of bulbs in a trough which dips down below stage level so as not to interfre with the view from the front rows. Grauman's Chinese Theatre, Hollywood, California. Auditorium with Sid Grauman and Jackie Cooper onstage during the premiere of Hell Divers on Friday, December 25, 1931. Photograph by R. R. Stuart. Courtesy of Kurt Wahlner. 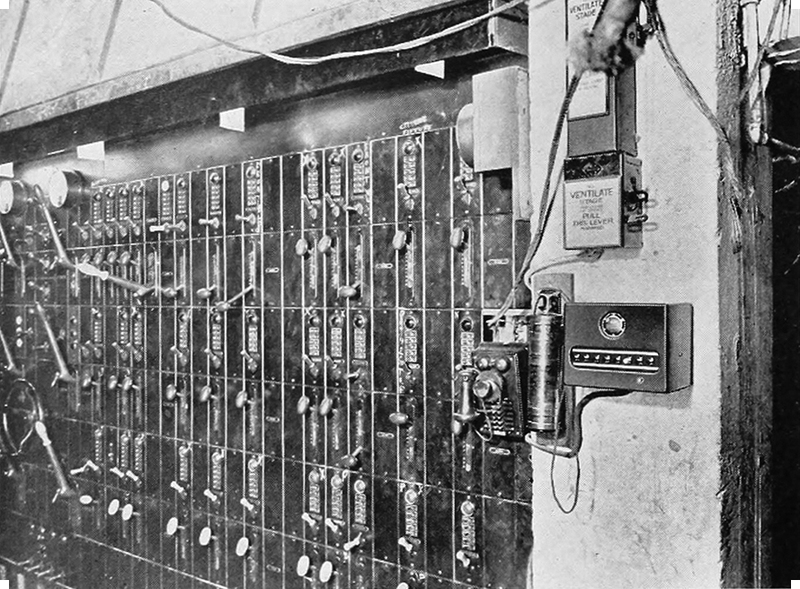 The switchboard is on stage right, with the door to the right leading to the exit court. There is more switchboard to the left of this photo; the massive board is a resistance board with five scene pre-selects, which means that one can set up five different lighting schemes, and you could switch from one setup to the other with dimmers on each one. Way to the left side of the picture is the master dimmer wheel, while the big knife-like switches are for the red, green and blue, colors. Grauman's Chinese Theatre, Hollywood, California. Switchboard looking southeast. Photo taken later in the engagement of The Gaucho, after Friday, December 16th, 1927. Photographer unknown. From Motion Picture News, February 4. 1928, page 334: "Brains and Arms of Showmanship in Phone Link" by Carl. J. Begemann. Motion Picture News, Inc., New York City. The nerve center of any theatre is the projection room. Without it, you would have nothing. The Chinese projection room was small, but it was packed with equipment, such as the Brenkert Combination Effects Projector on the left, which could project all sorts of colors and slides onto the stage, or the follow spots, but most importantly, the three Powers projectors with their Ashcraft lamphouses. The ports are all equipped with fire shutters, which could all come down with a crash in case of fire, which could easily happen with the nitrate cellulose film. Grauman's Chinese Theatre, Hollywood, California. Projection Room, 1928; photo probably taken during the 1927 run of The Gaucho. Photographer unknown. From Motion Picture News, February 4. 1928, "Brains and Arms of Showmanship in Phone Link" by Carl. J. Begemann. Motion Picture News, Inc., New York City. 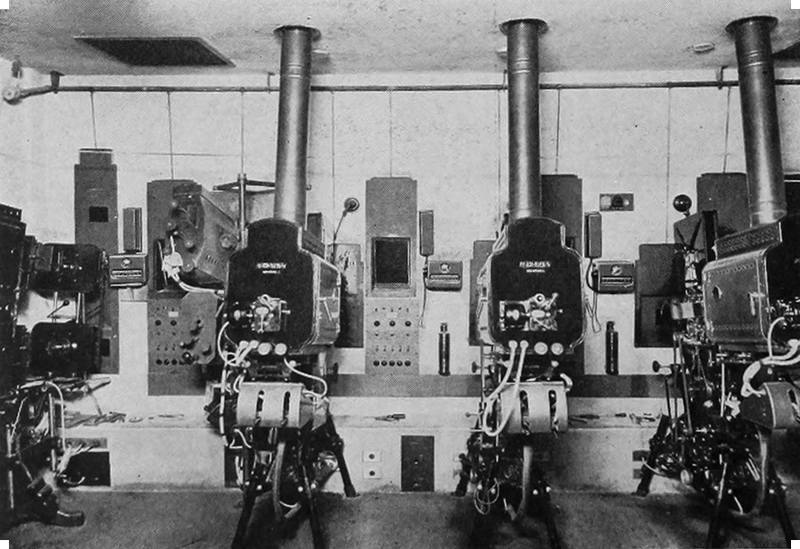 From left to right: Brenkert combination effects projector; two pole-mounted follow spots, the upper a Brenkert Type C3, the lower unknown; Powers 6B Improved projectors with Ashcraft lamphouses. The silent film was well served at Grauman's Chinese Theatre. The Chinese shot to the top of the list of DeLuxe theatres due to Grauman's strategy of creating a space where the imagination was overwhelmed, allowing for the transportaion of the viewer to wherever a film would take you. All of the design and craft of the theatre came together to support the feature length film. And this concludes our tour of the Chinese Theatre. We hope that you have enjoyed it. The Chinese will remain pretty much in this way until the introduction of Cinemiracle production of Windjammer in 1958. For a tour of the theatre at that time, take the Tour — 1958. Grauman's Chinese Theatre, Hollywood, California. 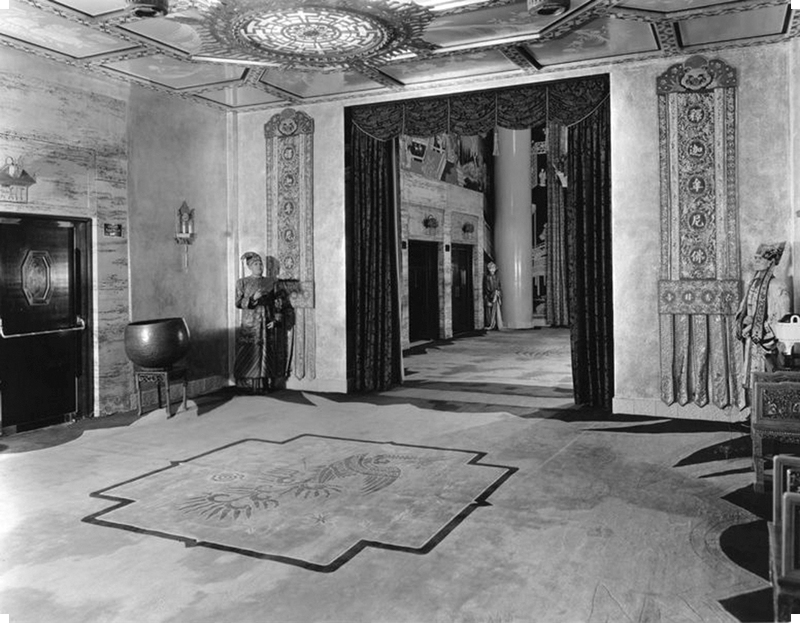 Auditorium, 1927; photo collage showing 18' x 24' screen. 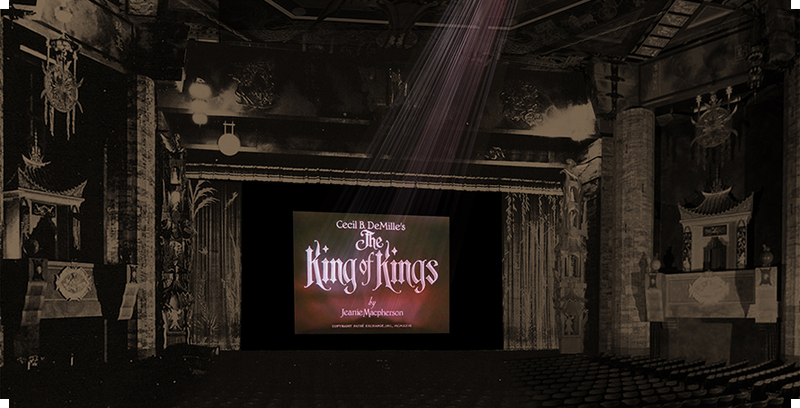 Title card for King of Kings, directed by Cecil B. DeMille. © 1927, DeMille Pictures Corporation. © Copyright graumanschinese.org. Background photo courtesy of the Theatre Historical Society of America, Terry Helgesen Collection.